Troy Lambert | Don't open that door! If you are interested in reviewing the book for a free copy, please contact me below, on Facebook, or Twitter. I’ll be writing again soon. Yes, today is release day for my collaborative book with Troy Lambert. I am excited to realize my dream of becoming an author. I know we all say that if we write, we are writers, and this is true. I know that’s what helped me keep moving forward, exactly what Kristen Lamb keeps saying. We Are Not Alone. We are writers. There is something about seeing your name on a cover. It’s amazing. It’s Magical. It’s scary as hell. Because now the responsibility kicks in. I’m an author. I have published a book and I plan on publishing a lot more! And that’s scary. All the what if’s come to play. That’s why I posted that picture of my mother and my brother above. 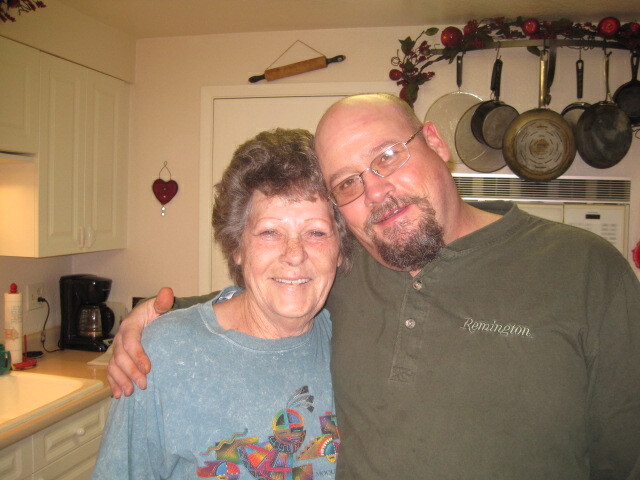 My mother died of lung cancer a couple of years ago. It took my life into a tailspin that only in the last year, I’ve been able to recover from. But that’s another story. I posted the picture of my brother and mother to remind me that life is short. Happiness is fleeting. But Joy, deep and lasting, soul filling joy can be found. You just have to believe. And trust me, sometimes it’s damned hard to do. I dedicated this book to my brother, because, well, he deserved it. He has been my best friend since I can remember. He and I shared secrets and tears and everything I would imagine a best friend does. He is my “Bud”. And for the record, again, I really did NOT try to kill him while we were growing up. It may have seemed that way, but, most of the time, I was right there with him, cheering on his courage (or naivete) to try the stories and adventures I came up with. He is the strongest, most amazing man I’ve ever met. We raised each other right. SO, here are the links to my first book. I look forward to hearing from you and I’m glad you’re coming with me on this journey. We Are Not Alone. And where we are going… that’s a VERY good thing. Please feel free to comment and share this post. I would actually love to hear from you and gain new friends. Coming Soon – Cover Reveal August 4th! Where a person can die, but not really. Where survival means the unimaginable. Where the reservoir holds a horrific secret, not everyone is prepared to face. A boy’s fascination becomes a moving massacre. A young woman’s sacrifice turns hairy, a narcissist meets the ultimate dance partner, and much more. Once you step Into The Darkness, you’re already gone. 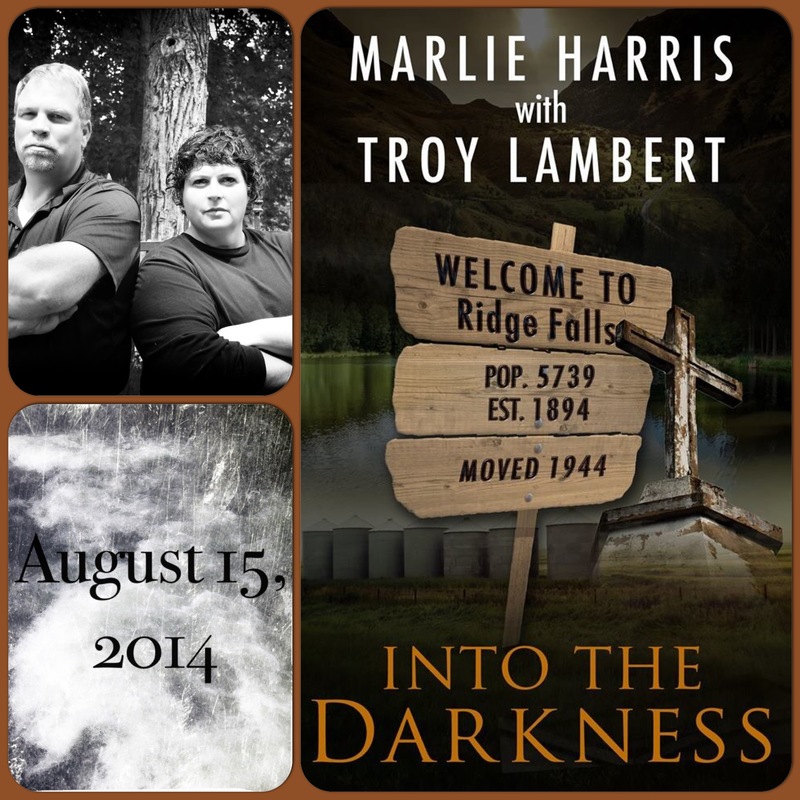 Author’s Marlie Harris and Troy Lambert bring the first peek into the town of Ridge Falls. 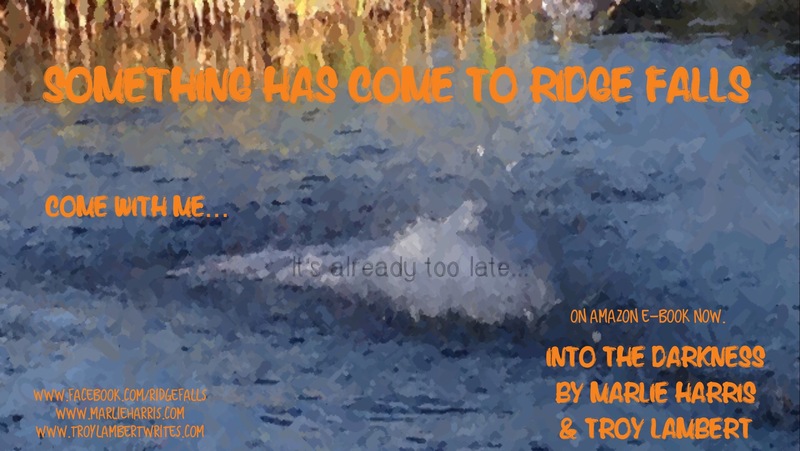 Go to the Facebook Page Ridge Falls , like it, and learn more!